WE’RE NOT JUST THE PREMIER HIGH-DENSITY FOAM PRODUCER, WE’RE YOUR PARTNER FOR MACHINING, PARTS FABRICATION, PATTERN-TO PRINT, SCALABLE CUSTOM SOLUTIONS, AND TESTING SERVICES. General Plastics Manufacturing Company does far more than simply supply LAST-A-FOAM® rigid and flexible polyurethane foam sheet stock to Tier 1 and Tier 2 OEMs. We also machine, fabricate and construct foam parts and assemblies to exacting customer specifications for diverse commercial, industrial, military and composite-manufacturing applications. We are adept in complex laminating processes and materials, and we develop custom solutions and formulations to support our customers. Look to us as a highly capable, cost-effective and responsive resource for high-performance parts to satisfy your most demanding requirements. Eliminate the added time and transportation costs of sending parts fabrication, assembly and foam finishing to a third party. In-house fabrication services span complete built-to-print production, CNC machining, molding, assembly, tooling and more. Our topnotch production services team is also proficient in painting, adhesive bonding, potting and resin-infusion processes. Why tie up internal resources on non-core processes, or pay to ship your foam to other shops when we offer dependable and scalable production services onsite? From parts fabrication to custom formulation, we have the expertise and resources to address your LAST-A-FOAM® application. Our testing services encompass the full spectrum of quality assurance and testing functions, offering a convenient single source to fit your particular requirements. Rely on us for physical property testing and flammability testing. We look forward to collaborating with you and your engineers on developing test plans or samples tailored to your particular needs. Whether you have a project in the design stage or need to confirm material performance characteristics, General Plastics is well-qualified to verify materials against requirements and issue a certified test report. Our Testing Services Group offers a wide range of tests in our on-site testing laboratories, which include an FAA-certified burn test facility. All tests are conducted using calibrated equipment that is traceable to NIST. General Plastics offers extensive CNC machining capabilities to make parts that fit your needs and specifications. Our customer service, engineering and CNC teams will work closely with you from concept to completion. 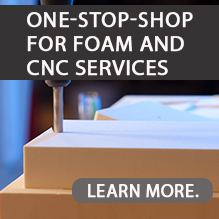 Our unique foam formulations, proven pattern-to-print capabilities and high-capacity production facilities enable us to scale production from small runs of specialty parts to ongoing, high-volume OEM parts programs. Whether you require a custom formulation, foam material in a specific size or shape, poured-in-place mold services, or products already machined and bonded for your application, we tailor solutions and support your needs.